Get to know R2Deepu and his random-buddies! You know what's saturated? Gaming content. So this is just comedy now hehehehe. Ep. 35 Laura Lania: Spirit Animal w/ SisterSarah | @GeeksOfNewYork | Gaming News, Movie News. Twitch streamer SisterSarah joins the geeks at the Creek and the Cave. E3 is over, but there's still plenty to talk about. The geeks talk about some of the cringe moments of the show, the drama revolving a supposedly missing Laura Lania, and Sarah doing some real-life shooting. 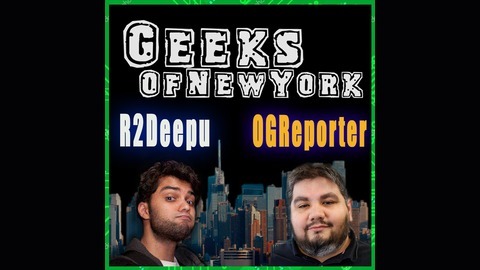 * Subscribe - http://www.youtube.com/channel/UC7DHwktfb3u4XTx-uvA9qEg Subscribe and Review on iTunes: https://itunes.apple.com/us/podcast/geeks-of-new-york/id1173303635?mt=2 * Favorite us on Soundcloud - https://soundcloud.com/geeks-of-new-york * Twitter - http://twitter.com/GeeksOfNewYork * Facebook - http://www.facebook.com/GeeksOfNewYork * Instagram - http://www.instagram.com/geeksofnewyork/ About Geeks of New York: A weekly review of all things Gaming, Movies, Television, and more! Hosted by Oscar Gonzalez and Deepu Gill! Ep. 34 pt. 2 "Sony, Nintendo and the Rest" | @GeeksOfNewYork | Gaming News, Movie News. Ep. 33 "StockStream and Switch Voice Chat" | @GeeksOfNewYork | Gaming News, Movie News. Ep. 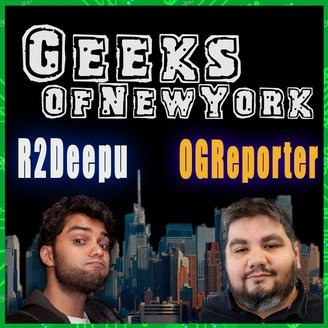 32 "Black Bond" w/ Joseph Roberts & Assar English | @GeeksOfNewYork | Gaming News, Movie News.